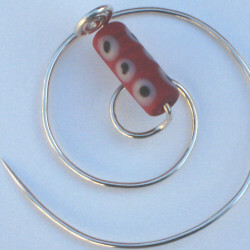 Fibula style brooch all in one piece with no tricky clasps to worry about. 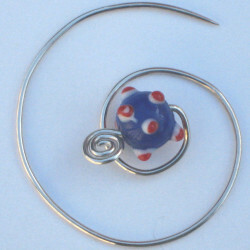 Handmade glass bead in the centre. These can be picked by requesting a colour, but as they are hand-made no two will be the same. You have to take a bit of pot luck here! All beads will be interesting though. Use by pushing the sharp end of the brooch through your clothes once, twist, then push the sharp end through a second time.